Denver-based Dixie X Elixirs and Edibles recently launched a new line of ingestible CBD products to complement its medicated foodstuffs, tinctures, and creams infused with THC. Project CBD gives Dixie's CBD products a thumbs-down. 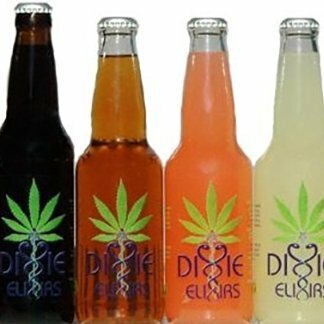 Denver-based Dixie X Elixirs and Edibles recently launched a new line of ingestible CBD products to complement its medicated foodstuffs, tinctures and creams infused with THC. Dixie X, founded in 2009 to serve the Colorado market, now operates under the umbrella of Medical Marijuana, Inc. (MJNA), a publicly traded start-up founded by Bruce Perlowin and based in San Diego. In the 1970s Perlowin was busted for shipping marijuana into the United States and spent seven years in prison. He is no longer officially associated with Medical Marijuana, Inc., but remains a key player in Hemp, Inc., another start-up company traded on the OTC stock exchange. In the spring of 2012, Dixie X entered into a licensing agreement with Red Dice Holdings, another subsidiary of Medical Marijuana Inc. Dixie owner and managing director Tripp Keber is president and CEO of Red Dice Holdings and a board member of Medical Marijuana, Inc. “I make companies to sell companies. Make me an offer, and I’ll ride off into the sunlight with saddlebags of gold,” Keber told The Daily Beast. The arrangement between Dixie and Red Dice is structured so that Medical Marijuana, Inc. is able to utilize only the CBD aspect of the licensing agreement, while MJNA eschews responsibility for Dixie’s THC products. The legal status of CBD is somewhat muddled. Cannabidiol is conspicuously absent from the DEA’s recently updated list of proscribed drugs. But “marijuana,” including CBD-rich varieties, continues to be listed as a controlled substance. CBD as a natural compound exists only in marijuana and in industrial hemp, which are both illegal to grow in the United States. Although industrial hemp contains more CBD than THC, the overall cannabinoid content of hemp plants is much lower than what’s found in CBD-rich marijuana strains. The kind of CBD-rich plants being grown for the medical market in the U.S. produce much more cannabidiol than fiber hemp plants. Medical Marijuana, Inc. says it circumvents the federal prohibition by extracting CBD from industrial hemp—not from marijuana—that is grown outside the United States in five different countries. MLNA won’t disclose which countries. The initial extraction is performed by another Medical Marijuana, Inc. subsidiary, Phytosphere, which provides raw hemp paste to Dixie X and its sister firms. Like other industrial hemp products legally imported into the United States, this hemp paste apparently contains a minuscule amount of THC; hence it’s legal to bring it into the United States, according to Dixie officials. Project CBD received samples of the Dixie Scrip capsules and the Dixie X tincture and submitted these for analysis to the Werc Shop in Los Angeles and Halent Laboratories in Davis, California. We did not test the salve. Both analytical labs confirmed that the Dixie Scrip capsules (priced at $11 per unit) contain approximately 20 to 25 milligrams of CBD and one milligram of THC. The amount of THC in the capsules measured less than the federal government’s .3 percent limit for THC permitted in industrial hemp. “In order to be able to ship these products across state lines we need to keep the THC to a trace amount so we can service people all over the United States,” explained Dixie X marketing specialist Christie Lunsford. The 20-something-to-one ratio of CBD-to-THC is similar to a CBD-dominant cannabis phenotype that’s available in California and other medical marijuana states. This CBD-dominant phenotype has been circulating under various strain names – Oracle, AC/DC, and Cannatonic, among others. According to Dixie’s website, “Dixie X Hemp Oil Scrips” capsules contain several ingredients in addition to CBD: turmeric powder, “conjugated linoleic acid,” and white willow bark (herbal aspirin). Test results from The Werc Shop indicated that the Dixie Scrip capsules were nearly devoid of terpenes, which were lost during processing. Creating CBD and THC from raw plant matter involves a process known as decarboxylation. When heated, raw CBD-Acid decarboxylates into neutral CBD and raw THC-Acid becomes neutral THC. But it takes twice as long (if not longer) to decarboxylate CBD than THC. And the decarboxylation process removes the volatile terpenes, which evaporate at much lower temperatures than are required to decarboxylate CBD and THC. Some cannabis extract-makers make a point of putting terpenes back into their decarboxylated products. When tested by The Werc Shop and Halent, the Dixie X Dew Drops, a syrupy, cinnamon-flavored, glycerin-based tincture, was found to contain a negligible amount of THC (below .3% by weight in accordance with federal law) and a small amount of CBD. The Werc Shop reported 1.51 milligrams per gram of CBD in a bottle containing 1 fluid ounce of tincture, which amounts to about 45 milligrams of CBD. Halent got slightly higher numbers: 2.1 mgs per gram of CBD, or about 62 milligrams of CBD in an ounce of the Dixie Dew Drops tincture. Halent also reported approximately 8 mgs of other cannabinoids (THC, CBG and CBC) in the tincture. Both labs found CBD concentrations at significantly lower levels than the “approximately 100 mgs CBD and other cannabinoids” promised on the label of the one-ounce Dixie X Dew Drops ampule, which retails for $40 a bottle. Halent also analyzed the contents of a two-ounce bottle of the Dixie X Dew Drops tincture, advertised as containing 500 mgs of CBD and other cannabinoids. Halent found 280 mgs of CBD plus 37 mgs of other cannabinoids in the two-ounce ampule, which sells for $160. Toning down the medicinal claims for Dixie’s CBD products seems appropriate given that their therapeutic value is limited by the paucity of biologically active terpenes and THC, which may result in disillusioned consumers who were hoping for more pronounced results. Others may benefit to some degree from these so-called food supplements. And for many people, the Dixie X CBD products might be the only way they can access cannabidiol, especially if Medical Marijuana, Inc. is able to market its products nationwide. Whether Dixie’s CBD products are ultimately successful in the marketplace may come down to a matter of cost-effectiveness: Do they contain enough CBD on a dose-per-dollar basis to justify Dixie’s asking price when more concentrated CBD extracts, infused with a synergistic bouquet cannabinoids and terpenoids, are becoming available in states where medical marijuana is legal? As we go to press, we find this message from Dixie Botanicals on its website: “We have revised our labels for our small containers, and these small labels do not have enough room for the Supplemental Facts box.” Thus there is no indication of how much CBD is in these small containers, but consumers can allegedly learn “the precise amount of CBDs per serving” by visiting Dixie’s website.